Wil Wheaton’s blog is a source of many kinds of delight, but this post about role playing gets an amen. Warren Ellis is a lot of things, and this post sums many of them up well.Â He shines here as a futurist able to put himself into a historical context while writing poetically.Â “This is the path people walked when they first thought about how to talk to time,” indeed. Hey, it’s the Goodrich blimp! Yeah, yeah, I know they don’t have a blimp. I was at SMO this evening trying to get a couple night landings in, though the clouds had other ideas.Â Even though I didn’t get much flying in, I did get to see the Goodyear blimp doing low maneuvers over the airport. They aren’t quite touch and goes, but that’s what they look like from afar. Anyway, only one shot really came out. That’s Santa Monica’s tower in the blurry background. 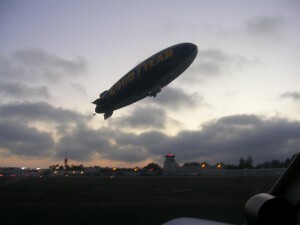 Posted in Aviation, blogbook | Comments Off on Hey, it’s the Goodrich blimp! My capsule review of Nancy Isenberg’s Fallen Founder: The Life of Aaron Burr is posted on Bell, Book, and Candle. Here’s an amazing bit of americana.Â Via BoingBoing.Â The kid’s diagnosis is correct. Street Use has followed up on its ominous segways sighting by finding a monster segway.Â Video included. I’ve been living in California for a while now, and the place still manages to amaze me.Â Not just the people, who are really sort of wackily charming, but the state itself.Â This week the LA Times tells me that there’s a hunk of land near Fillmore that just heated up to 800 degrees F.Â Apparently it just does that.Â Man, what a weird place. I updated the X.509 certificates on lunabase today.Â If you have a jabber account, you may see a new one, replacing the one that expired 2 years ago(! ).Â The local certificate authority is now reasonably well organized (thanks Phil), so future changes should be less painful. You are currently browsing the Walking on the Moon weblog archives for August, 2008.